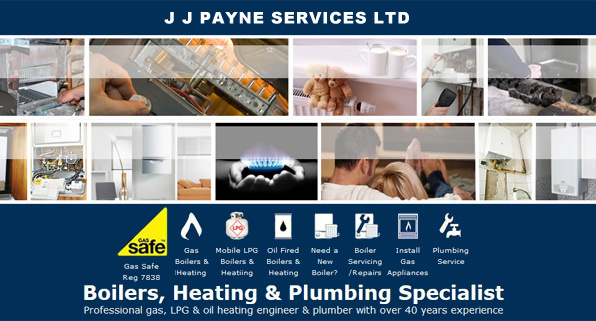 JJ Payne Services Ltd are specialist plumbing and heating engineers serving Norfolk and East Anglia. We offer a full range of plumbing and heating services from boiler changes to boiler installation and repairs. Our experience and service covers not just natural mains gas but also liquefied petrolium gas (LPG/Mobile LPG) and oil filled boilers, central heating & hot water systems. You will always find our gas, oil & LPG boiler, heating, water systems and installation of gas appliances fully compliant with the latest legislation & regulations to ensure the safest possible standards including being Gas Safe Registered (previously CORGI). Our plumbing services includes everything from fixing leaky taps to installing new bathrooms and pipework for kitchens and bathrooms. We are one of the few companies in Norfolk who are natural gas, oil and LPG qualified. As a family run business with over 45 years professional plumbing experience we are small enough to care and big enough to deliver the highest standards. We are able to offer a rapid response Service within hours of a telephone call so for an experienced plumber ready to help you Call JJ Payne Services Ltd.